Android Wear is undergoing an interesting transformation. While tech companies like Motorola and ASUS are abandoning the platform, fashion brands like Michael Kors and TAG Heuer are showing interest. Michael Kors announced two new watches back in March, the Access Grayson and Access Sofie, and now they are finally on sale. The Grayson (pictured on the top left) is aimed at men, with a larger 1.39-inch 454x454 display and 370mAh battery. The Sofie is targeted towards women, with a smaller 1.19-inch 390x390 screen and 300mAh battery. Besides the screen, both watches have identical specifications - Snapdragon 2100, 4GB of storage, 512MB of RAM, and IP67 water resistance. Neither watch has NFC, LTE, or a heart rate sensor. Reviews for both watches are now available, with both receiving moderate praise. PCWorld said the Sofie, "is a solid choice for an Android Wear smartwatch simply because it’s a good watch. It’s speedy, it charges fast, and its battery will last you through most of your busy days." 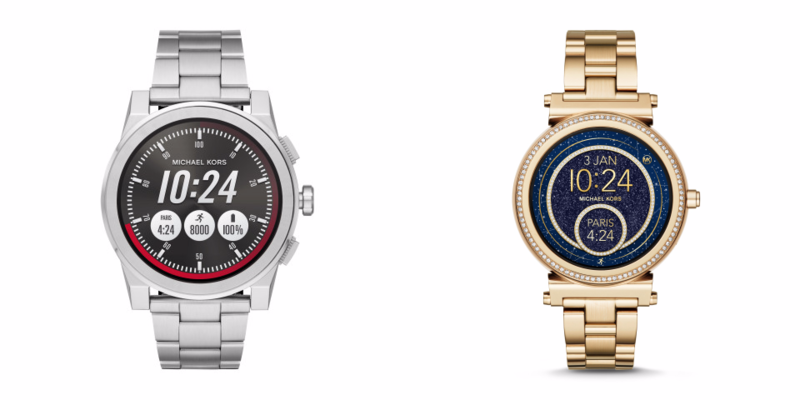 TheNextWeb said in its review, "Michael Kors’ new watches aren’t exactly impulse buys, but they offer a reliable gadget experience with a variety of traditional designs. For many people, that will be enough." The Access Sofie comes in five variants - Sable, Gold, Rose Gold, Silver, and a special Silver model. All of them cost $350, except the last one, which goes for $395. The Grayson comes in four models, all costing $350 - Gold, Silver, Black, and Navy.